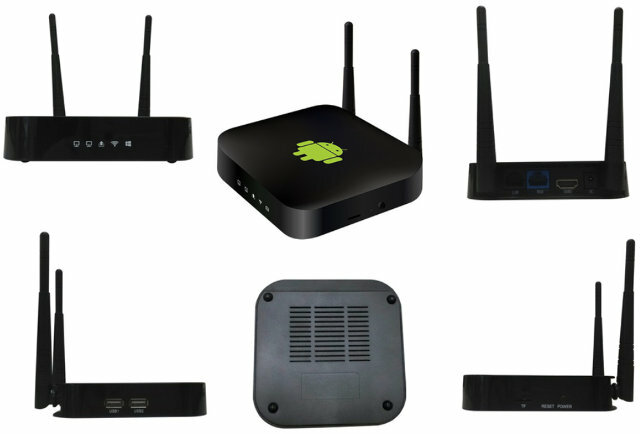 A few months ago I wrote about SinoVoip BPI-R1 board powered by Allwinner A20, and being a sort of hybrid media player / router system running Android with 5 Gigabit ports, Wi-Fi, HDMI output and SATA, but now somebody made an actual product which they call an “Android TV Box Wi-Fi Router” sold under the model name ZMT-330A, and based on Nufront NS115 dual core processor. Misc – IR receiver, reset (recovery?) button, and power button. 5x LEDs on front panel. Based on these rather strange specifications, it would seem Nufront NS115 is handle the Android 4.2 part, and there may be a separate Wi-Fi SoC with 32 to 64 MB RAM and 8 to 8 MB SP I flash running a Linux? OS to handle the router part, which does not make a lot of sense. Nufront NS115 is also a relatively old processor (about 2 years old), and I reviewed an HDMI TV dongle based on NS115, and found it to be OK, but with not-so-good video playback capabilities. I thought the chip was dead in the water, but it’s still around apparently, and hopefully they’ve improved some of the shortcomings. If you’re a looking for a system with processor with some (GPL) source code, you can give it a pass. Zome ZMT-330A can be purchased on Aliexpress for $69.99, but the seller has no feedback, and I could not find this device anywhere else. Now appearing in “pre-sell” on Aliexpress too, for the same ~$70. BPI-R1 board has space and connector for (at least 2.5″) HDD. But I’m not sure it’s ultimate device, or rather a useless monster. For one, I already have NAS. Paid a lot for it, and while hw may be not the coolest nowadays, it’s metal case actually designed to dissipate heat from couple of HDDs. Then, if it has HDMI, it’s gotta stand by TV, but TV is standing in bedroom, and HDDs are pretty noisy things, so if I use NAS during late-night hacking, it bothers somebody. Oh, and my router usually stands in the middle of apartment, to offer good wifi coverage, and that’s away from where my tv stands either. there is a product called timebox, in china. It is A31s+1G DDR3+8G EMMC+ Router(2LAN 1WAN 11n & 11ac), of course, it support 2.5″ HDD insite. I think it is a android smart router. The link is http://z.jd.com/project/details/1579.html , but in chinese.